Ever since I began studying Chinese food some years ago, I noticed how much fermented and pickled foods factor into their cooking. Most of us know about Korean kimchi and many have had Japanese pickles before, but Chinese pickles are still relatively rare here in America. 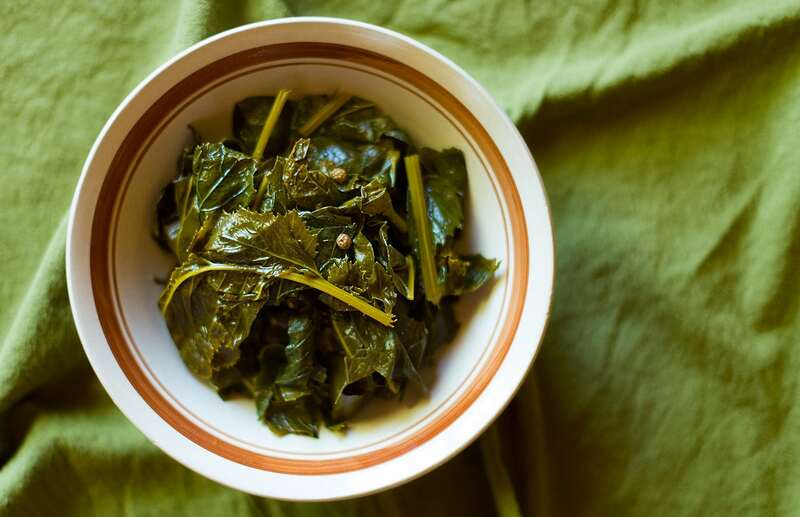 One of my favorites — and one that can easily be done with wild food — is their ubiquitous pickled mustard greens. Take a look around Chinese restaurant menus (not including the cheapy Chinese steam-table places) and you will see them. Often used in soups and stir-fries, pickled mustard greens come in various forms and styles. Many are pickled with vinegar, but some are old-fashioned brine pickles, which means the greens are fermented. That’s the kind I decided to make. My recipe is an amalgam of a dozen or more I looked up in an assortment of Chinese cookbooks, notably Fuchsia Dunlop’s Land of Plenty: A Treasury of Authentic Sichuan Cooking and Eileen Yin-Fei Lo’s Mastering the Art of Chinese Cooking. Keep in mind this is a lacto-fermented pickle, so you will need a cool, dark place for it to do its thing. A quiet corner of the house is a good place, but not the refrigerator, which is too cold. Bowls to hold the mustard greens so you can weigh them. Something to pickle your mustard greens in. I happen to love these German style fermentation crocks. They’ve definitely upped my game in terms of lacto-fermenting things, and they look cool. You can also use quart Mason jars combined with narrow jelly jars to hold the greens under the brine. A kitchen scale. Every kitchen needs one, and you will want it to measure out an exact amount of salt. I’ll give you rough volumetric amounts in case you don’t have a scale, but the finished pickles may not be as good. Good pickling salt. Not iodized is key. Morton’s makes pickling salt that’s great, but any kosher salt will do. I prefer to use fine-grained French grey sea salt. Why? fine-grained salt dissolves easier, and the impurities in the sel gris, the gray salt, are other kinds of salt that add flavor. Not vital, but it’s a good choice. Spices. 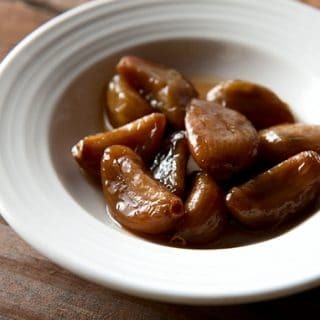 I use Tien Tsin chiles from Penzeys Spices for the dried chiles because that’s what you might use if you were in China. But any hot, dried chile works. I also sometimes add in Sichuan peppercorns. Star anise. You can buy it in many supermarkets, but you can substitute anise seed or even fennel seed. How long you ferment is up to you. Minimum 3 days at room temperature, or you will wonder what the fuss is about. A week is good for beginners, but I prefer several weeks or even longer. The longer you go, the saltier and more pungent everything gets. I ferment my greens for 3 weeks, which is an awful long time for some people, and not enough for others. The greens just looked right. How did I know this? Hard to say. I used The Force. Whatever the power was that guided me, it did not steer me wrong. 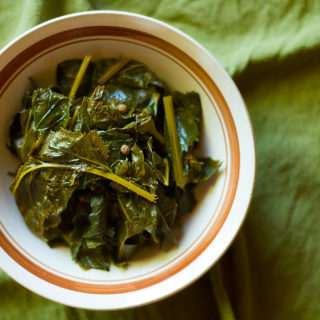 Pickled mustard greens are a flavor bomb. Pungent, because, well, they are mustard greens, spicy from chiles and Sichuan peppercorns, tangy from the ferment and crunchy-ish, too. Not cracker crunchy, but the greens still had some bite to them, which was good. I was worried that the ferment might make them limp and slimy. If you get a weird mold on top, chances are the brine isn’t salty enough or some greens are floating on top. You need to remove that mold carefully. If you see black mold, toss the batch. Keep an eye on the brine level in your jars. Evaporation happens. Don’t ferment over 85°F, although given that we are talking about a cool weather green like mustard I don’t know how you’d be in that temperature. Regardless, slow fermentation is better here. I like it around 66°F to 68°F. When your pickled mustard greens are fermented to your liking — start tasting at 3 days — move them into the fridge, where they will keep until the Second Coming. Seriously. I’ve have some in the fridge for almost 2 years and they were fine. You can use any sort of mustard, radish or turnip greens, but I used wild mustard. It grows with abandon around the farm fields in the Sacramento-San Joaquin Delta, and can be harvested by the grocery bag in minutes. Start looking for them here in NorCal in winter, sometime around Christmas. 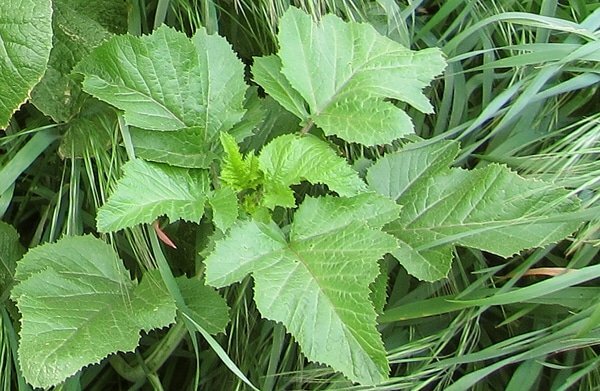 If you are harvesting wild mustard — or garden mustard greens, for that matter — do so before your weather gets too hot. In most places, that means by mid-June at the latest. If you pick in hot weather, you will be sad: The leaves will be impossibly bitter. Better to wait for the fall crop than try to push things in July. How to use these fermented beauties? I use them as the “green thing” in everyday stir-fries, and they are also really good in noodle soups. I suppose you could chop them and use them in a dumpling filling or just slap a leaf or two on a sandwich. If you come up with some other good uses, let me know. Meanwhile, get out there and pick yourself some wild mustard! It’s there for the taking. Much of this recipe is malleable, but the ratio of salt to water is not: Too much and you kill any ferment, too little and everything can rot. Your nose is a good guide. If your fermented greens stink like rot, don't eat them. They should have a pleasing pungent smell like a cross between mustard and dill pickles. Once the greens have fermented to your liking, seal the jars and store in the fridge. They'll last this way for a year or more. Bring everything but the salt and mustard greens to a boil in a large pot. Turn off the heat and let it cool to room temperature. Pour everything into a vessel that you can weigh, and weigh the water plus spices in grams. Write this down. Wash you mustard greens well, then shake them dry and weigh them in grams. Write this down. 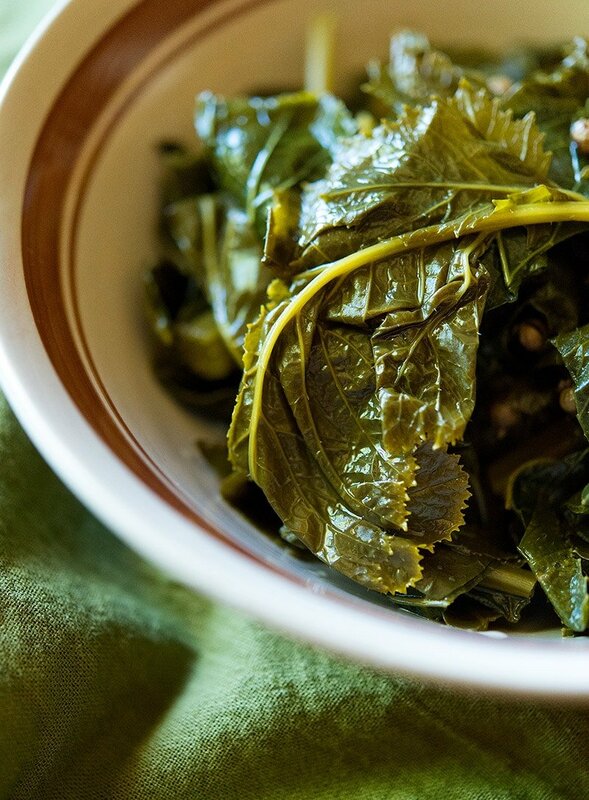 When it's cool, weigh out 2 percent of the total weight of greens + water + spices in salt. Dissolve this in the liquid. If you use fine-grained salt you should have no problem. If the salt doesn't want to dissolve, stir until it does. NOTE: If you don't want to weigh all this out, just use the salt ratio I have in the ingredients list. It is approximately the same, but not exactly. Get out your fermenting crock or 5 quart-sized Mason jars with 5 narrow jelly jars to keep the greens submerged. You need this many because you will only pack the greens in 3/4 of the way into the jars -- you want at least 1 inch of brine above the level of the greens. Submerge the greens in the brine, using a chopstick or skewer to get rid of any air bubbles. Put the weights on the greens if you have them. If not, place the Mason jars in the sink and put the narrow jelly jars in them. The brine will overflow but the narrow jar will prevent the greens from contacting the air. Set the jars on a baking sheet and put in a cool place away from direct sunlight. Let them ferment at least 3 days, or longer. Mold may form eventually. This is normal. I wait until the mold cap is pretty solid, then pick it off. It's not harmful unless it's black. Finish by packing jars tight with the fermented greens, leaving about 1/2 inch of brine over them. Tighten the lids and put in the fridge. They will continue to ferment very slowly, so open the jars every week or two to release pressure. If you want to kill the ferment, boil the brine and cool before packing the jars the final time. Note that prep time does not include fermenting time. You can find all sorts of ways to pickle and preserve your harvest here on Hunter Angler Gardener Cook! Nancy: Yes it would. It’s also great in pesto. Sorry but any chance I can get the salt in grams……/ I guess its like 2 to 3 %? Carlo: Exactly, you want 2% by weight. A cup of salt is 273 grams? So that would be 205 grams right? Thank you for constantly inspiring us to forage further. Your ideas and recipes are amazing ! I’d like to share a long time favorite of mine : Gundruk. A Nepalese traditionnal recipe (From Sandor Katz, for the credits) this ultra simple recipe call for greens mashed up in a jar after letting them whilt under sunlight. Than after some days, spinkle over to dry. Normally, it’s easier to try with the brassica familly as their juice is plenty, but I’ve succeded including Plantago m., Achillea m., Clovers sp. in smaller proportion as «medicinal» flavoring. I like you to try and share a formal recipe from your experience !